Anastacia has undertaken Seership and Oracular Readings since 1995. As a working priestess and trans-denominational minister with an international clientele, she works with people of many faiths and traditions. General Guidelines: Readings begin using unaided Seership. Through this means, 1-3 primary, current life themes are discerned. 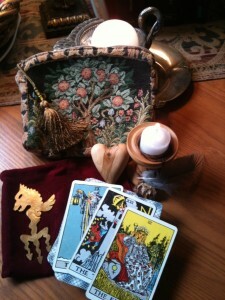 The reading progresses as additional details are obtained using the Waite-Smith Tarot. At a Reading’s conclusion, both inspirational and practical guidance are in hand. Readings often include specific follow up work for the client to perform on their own. This work seats the Reading into the life pattern. If desired, progressive Reading implementation support is available via Sessions. Prices as of September 15, 2018: All readings are paid in advance via PayPal, no exceptions. First Time Client Readings require 1.5-1.75 hours and cost $150. GoToMeeting® is used to support all Readings, offering both phone and internet connection options. Recordings are possible in Mp4 format, however note taking is recommended. For additional inquiries or to schedule a reading, email Anastacia directly .